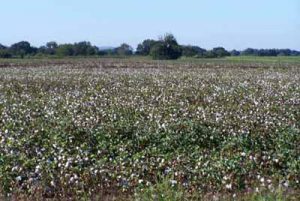 Amazingly enough, cotton once was king in this part of Texas, even though one thinks more of cattle ranches rather than large-scale cotton production. By the mid 1700s, the Spanish missions established at the headwaters of the San Antonio River produced several thousand pounds of cotton fiber annually, which was spun and woven into cloth for local consumption. The climate was just right to grow cotton, all through the Rio Grande Valley and other more or less temperate regions. Once the threat of Indian raids diminished after the Civil War, and railways opened up access to distant markets, cotton agriculture thrived all across Texas – mostly on a share-cropped basis, where a landowner contracted with an otherwise landless tenant laborer to cultivate and harvest in exchange for a share of the resulting crop. 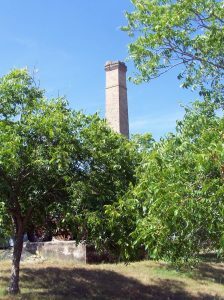 And cotton grew well – very well indeed, although actual physical relics of it having done so around San Antonio are sparse and most usually in ruins. Before the Civil War it was almost axiomatic that intensive cultivation of cotton speedily exhausted the most fertile soil – but that wasn't what killed the cotton fields around San Antonio. The not-quite-unexpected disaster came with the arrival of the boll weevil plague – an insect pest which slowly began moving north from Mexico late in the 19th century and hit the American cotton-growing belt in the 1920s. The boll weevil and the stock market crash of 1920 sent local cotton producers into a tail-spin ... and by the time efficient pesticides were applied to cotton fields after WWII, many growers and those who made a living from processing the cotton harvest had moved on to other crops – or other means of making a living. 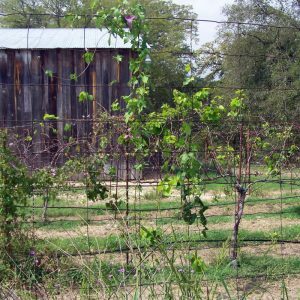 Since the 1920s, suburbia has reached into the vicinity of formerly San Antonio and New Braunfels agricultural lands, but there are some still-existing or repurposed remains. The most noticeable are the ruins of industrial cotton 'gins' – 'gin' being a shortening of 'engine' – that mechanical device developed to efficiently and economically separate the cotton fibers from the seeds. There are three that I know of, although there are probably many more. The most famous that I know is the building in Gruene which now houses the Gristmill Restaurant. Indeed, Gruene was a whole little town built upon the cotton industry. When it all went to nothing in the 1920s, Gruene became stuck in a lovely and preservative kind of stasis, just as it was built in the late 19th and early 20th century. Now it is a destination on the north margin of New Braunfels – and well worth the visit. The second old cotton gin is out in the fields on the southern fringe of New Braunfels – a little town now a crossroads of secondary roads. It used to be called Comal ... and there, in a grove of pecan trees are the yellow-brick ruins and tall chimney stack, along with a brief row of stores which were the center of lively rural life at the same time as Gruene. And in the gentle valley of the Sister Creek there is a third building – a frame one, this time – which also housed a cotton gin, and now serves as the showroom for Sister Creek Winery. There is still cotton in Texas fields, though; a couple of years ago, I took some pictures of cotton growing near Winters, just south of Abilene – and last year, we spotted huge trailer-truck sized cotton bales just outside Lockhart, at the edge of the parking lot at the Kreuz Market. Cotton – perhaps not king any longer, but still a haunting presence.